At High Plains Alzheimer's Special Care Center in Lincoln, NE, you'll find committed caregivers and a nursing and management staff who truly care about the needs of your loved one. We offer both memory and respite care services within our beautiful, newly-built location. Respite Care: Less than four minutes from Lincoln Surgical Hospital and with a trained nursing staff on site, High Plains Alzheimer's Special Care Center is the perfect choice for your post-hospital needs. We have access to a variety of speech, physical and occupational therapists, all of whom are ready to help you recover and heal in order to head home sooner. Memory Care: Our memory care services go above and beyond with our caring staff specially trained in our Meaningful Moments® program. Through this program, caregivers build moments from our dementia residents' lives into their days at High Plains Alzheimer's Special Care Center to bring meaning and familiarity to each day. 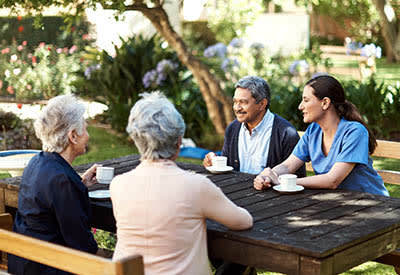 Residents of both memory and respite care at High Plains Alzheimer's Special Care Center have access to all of the features and amenities our community offers.